The Salt Room St. Charles has been designed to help ear infection sufferers relieve their symptoms and feel better in a safe, peaceful environment that feels more like a spa than a high tech treatment facility. Most of us have suffered an ear infection in our childhood. Around 75% of children succumb to ear infection at least once before they reach their third birthday. It is estimated that the US spends 5 million dollars in the treatment of ear infection. Although usually children are victims of ear infections, adults may also experience symptoms. Salt therapy at The Salt Room St. Charles is a non-invasive treatment that not only brings relief but also prevents its recurrence for significant lengths of time. If your child is suffering from an ear infection, salt therapy treatment at The Salt Room St. Charles will bring relief by reducing edema of the Eustachian tube which causes ear infection .The action of aerosolized salt particles, results in widening of the airway passages, better drainage and better aeration behind the tympanic membrane leading to a decrease in infection. 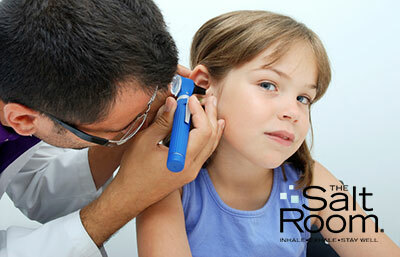 Most children who suffer from ear infection are victims of cold as well. Salt therapy treatment will provide relief from nasal congestion by opening the nasal passages. Salt therapy treatment also strengthens your child’s defense mechanisms to help him fight disease. A sophisticated computer built into the halogenerator is maintains the temperature, relative humidity and mass concentration of aerosol in the treatment chamber. In order to get the best results for ear infection, dry sodium chloride aerosol at a mass concentration varying from 1-16 mg/m3 with a particle size of 1-5 um are dispersed in the room. In rare cases side effects like skin irritation and a mild throat tickle may occur. If your child has a cough from cold or flu as well, coughing may intensify as the salt therapy treatment at The Salt Room St. Charles stimulates mucous clearance, but this will typically subside after the first couple sessions. Children with ear infection are typically irritable and fussy as the pressure can create significant discomfort. They may display symptoms like ear pain, hearing loss, discharge from the ear, vomiting, and fever. Cold and flu often lead into ear infection so victims often experience symptoms like running nose, body ache, cough and difficulty in breathing. Medical treatment through antibiotics is one remedy, but runs the risk of side effects. In extreme cases surgery may be required. Salt therapy at The Salt Room St. Charles is a completely drug-free and non-invasive treatment that can bring relief from the symptoms of ear infection. Contact us now so we can help you or your child feel well again.